A lot has been written about the importance of reviews in driving local traffic (here and here) and user engagement (here). At MerchantCircle, we encourage our members not only to ask their customers to write reviews but to create all kinds of fresh content to drive consumer traffic. 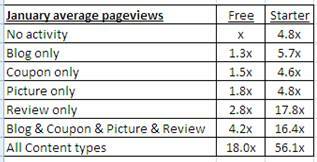 As part of this effort, we set out to understand the relationship between content creation and pageviews. The “Free” pageview numbers represent the relative average pageviews during January for our free members (i.e., those who aren’t buying our SEM products). The “Starter” pageview numbers represent the relative average January pageviews for our members who’ve purchased our entry-level “StarterCircle” package for $29/month. It’s amazing to see the value both groups derive when they take the time to create content on their listing. And for those who take advantage of every opportunity to create content, (i.e., those who have created all content types including newsletters and network ads) the rewards are huge! Interesting to note that each content type added drives incremental pageviews versus “No activity”. But, the real benefits come when merchants create multiple types of content on their listing. We here at MerchantCircle have long believed that getting traction online requires a real investment of either time or money. Our data suggests that for those merchants who invest both time (to create fresh content) and money (in advertising dollars), the rewards are significant.